​“Instead of telling him what to think, I told him how to think.” It’s a simple quote that embodies the mission – and mantra – of Harvard Business School Professor Clayton Christensen: encourage inquiry. It’s also at the root of his disruptive innovation theory, which has defined 21st century business and continues to profoundly impact organizations and their leaders across the globe. A world-renowned innovation strategy and growth expert, Professor Christensen is repeatedly recognized as one of the most influential living management thinkers in the world (Thinkers50). He revolutionized conventional management thinking with his seminal book, “The Innovator’s Dilemma” (Harvard Business School Press, 1997), which explored the radical paradox that great companies fail by making the “right” decisions in the “wrong” situations. The New York Times best-seller has been translated into 18 languages, sold in more than 25 countries and has deeply influenced some of the greatest business leaders of our time – among them Apple’s Steve Jobs, business magnate Michael Bloomberg and Intel CEO Andy Grove. But Professor Christensen believes one of his most enduring legacies will be an idea he first put forward in his 2003 book, “The Innovator’s Solution” (Harvard Business Review Press): don’t sell products and services to customers; address their jobs to be done. This seemingly simple idea holds powerful potential for reframing industries. The Jobs to be Done theory is the focus of his recently published book, “Competing Against Luck: The Story of Innovation and Customer Choice” (HarperCollins, October 2016). By understanding what causes customers to “hire” a product or service, businesses can improve innovation track records and uncover new growth opportunities. Professor Christensen also continues to focus the lens of disruptive innovation on the world’s most pressing social problems: health care, education and economics. In 2014, his HBR article, “The Capitalist’s Dilemma,” urges leaders on the Hill to evaluate outdated policies and embrace counterintuitive measures that can help improve our global economies. His best-selling books – “The Innovator’s Prescription” (McGraw-Hill, 2009), “Disrupting Class” (McGraw-Hill, 2008) and “The Innovative University: Changing the DNA of Higher Education from the Inside Out” (Jossey-Bass, 2011) – alongside the rich research and practical work of non-profit, non-partisan think tank The Clayton Christensen Institute, offer unique frameworks for better understanding and addressing these ever-evolving challenges. A widely sought-after speaker, advisor and board member, Professor Christensen’s research continues to be applied to national economies, start-up and Fortune 50 companies, as well as to early- and late-stage investing. He is also an experienced entrepreneur, having started three successful companies: CPS Technologies, innovation consulting firm Innosight, and investment firm Rose Park Advisors. He currently serves as a board member at Tata Consulting Services (NSE: TCS), Franklin Covey (NYSE: FC) and Ensign Group, Inc.
And yet, for all Professor Christensen has accomplished in his professional life, he urges people not to reserve “your best business thinking for your career.” Too often, he says, “we measure success in life against the progress we make in our careers.” This personal and provocative advice is detailed in his McKinsey Award-winning article turned best-selling book, “How Will You Measure Your Life?” (HarperCollins, 2012), in which he encourages all of us to think about what is truly important. Professor Clayton Christensen has long believed – and proven – that successful, outstanding companies can do everything “right” and yet still lose their competitive edge, or even fail, as new, unexpected competitors rise and take over the market. His seminal theory of disruptive innovation, first introduced more than three decades ago, has changed the way managers and CEOs around the world think about and create innovation. Professor Christensen builds on his groundbreaking research to help all companies understand how to become disruptors themselves. He provides clear advice on the business decisions crucial to truly disruptive growth, drawing from in-depth, real world examples across multiple industries. Year after year, we collectively spend hundreds of billions of dollars developing new products and services in the hope that they will succeed. And, year after year, we find that most of these efforts fail. For many managers, successful innovation is essentially a matter of luck. But it doesn’t need to be that way, says Clay Christensen. The key is understanding why our customers make the choices they make. As Christensen and his co-authors explore in their new book, “Competing Against Luck”, customers don’t buy products and services. They hire them to do a job. And knowing the job brings order and predictability to the swirl of innovation. He delves deep into several well-known companies that have done this right, explaining why no competitor has come close to copying IKEA in more than 40 years; how sleepy Southern New Hampshire University became one of the biggest success stories in continuing education of the last decade, and why Intuit’s Quick Books dominated the market just months after launching. Don’t leave innovation to chance, urges Christensen. As he discusses, Jobs to be Done isn’t innovation jargon; it’s based on his rigorously researched theory that explains what causes customers to do what they do. This causal mechanism is that every day, jobs arise in their lives that they need to resolve. He describes how managers can learn what these jobs are, and how they might develop a product that nails them well. Once you understand this, he shows, developing exciting new innovations becomes quite predictable. The way we learn doesn’t match up with the way we are taught. If we hope to stay competitive – academically, economically and technologically – we must reevaluate our educational system, rethink our approach to learning, and reinvigorate our commitment to learning. 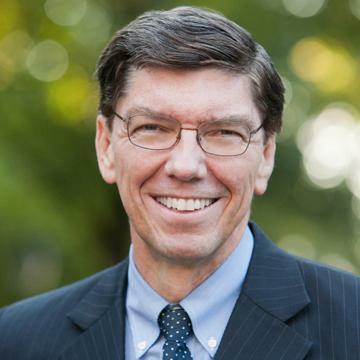 We need disruptive innovation, argues Professor Clayton Christensen. Everyone across the education sector (K-12 through higher education) benefits from understanding why and how to apply the theory’s principles. From online learning to blended learning and hybrid models, Professor Christensen dissects the unprecedented opportunities of a more personalized approach to learning. He discusses not only how the transformation to a student-centric education system could play out, but what educators, policymakers and others must do to ensure it realizes its promise.